The 1800 Watt Portable Power Station and Parallel Battery Charger allows for AC power in remote locations for convenient portable power. 1800 Watt Portable Power Station. Four 20V MAX batteries in (including Flexvolt), 15 amps out. Batteries and extension cord sold seperately. Runs most variable speed power tools. The 1800 Watt Portable Power Station and Parallel Battery Charger allows for AC power in remote locations for convenient portable power. Able to run most corded tools, it provides 1800 Watts (15 amps) continuous power and 3600 Watts peak power. 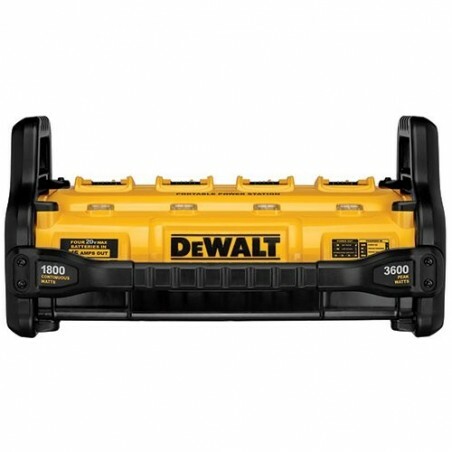 The DCB1800B runs on four DEWALT 20V MAX batteries (including Flexvolt), and for high power applications, four 20V MAX 3.0Ah DEWALT Batteries (DCB200) or higher amp hour are recommended to provide good results. 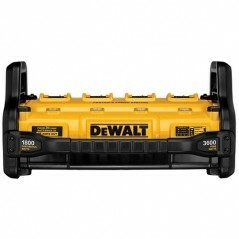 Not only can the 1800 Watt Portable Power Station power a corded tool remotely, but it also becomes a multi-port parallel charger for up to four DEWALT 20V MAX Batteries (including Flexvolt) when plugged into a wall outlet via extension cord (batteries and extension cord sold separately).